Well, we’re leaving in a week, so isn’t it about time that you started getting ready? Carol and I planned this trip for October, 2011, but, when our son-in-law got sick, we cancelled. The Myanmar we’ll be seeing is a different country than we’d have seen only a bit over a year ago. Though I don’t necessarily attribute all of the changes in the country to our planning a trip there, here are the remarkable highlights of what has happened in less than two years. 2011 March – Thein Sein is sworn in as president of a new, nominally civilian government. 2011 August – President Thein Sein meets Aung San Suu Kyi (Nobel Peace Laureate, who had been confined to house arrest) in Nay Pyi Taw (capital, but little-visited city). 2011 September – President Thein Sein suspends construction of controversial Chinese-funded Myitsone hydroelectric dam, in move seen as showing greater openness to public opinion. 2011 October – Some political prisoners are freed as part of a general amnesty. New labor laws allowing unions are passed. 2011 November- Pro-democracy leader Aung San Suu Kyi says she will stand for election to parliament, as her party rejoins the political process. 2011 December – Secretary of State Hillary Clinton visits, meets Aung San Suu Kyi and holds talks with President Thein Sein. US offers to improve relations if democratic reforms continue. President Thein Sein signs law allowing peaceful demonstrations for the first time; NLD re-registers as a political party in advance of by-elections for parliament due to be held early in 2012. Burmese authorities agree to truce deal with rebels of Shan ethnic group and order military to stop operations against ethnic Kachin rebels. 2012 January – Government signs ceasefire with rebels of Karen ethnic group. 2012 April – NLD candidates sweep the board in parliamentary by-elections, with Aung San Suu Kyi elected. The European Union suspends all non-military sanctions against Burma for a year. EU foreign policy chief Catherine Ashton, British Prime Minister David Cameron and UN Secretary-General Ban Ki-moon visit for talks on moving the democracy process forwards. 2012 May – Manmohan Singh pays first official visit by an Indian prime minister since 1987. He signs 12 agreements to strengthen trade and diplomatic ties, specifically providing for border area development and an Indian credit line. 2012 August – President Thein Sein sets up commission to investigate violence between Rakhine Buddhists and Rohingya Muslims in the west of the country. Dozens have died and thousands of people have been displaced. Burma abolishes pre-publication censorship, meaning that reporters no longer have to submit their copy to state censors. In a major cabinet reshuffle President Thein Sein replaces hardline Information Minister Kyaw Hsan with moderate Aung Kyi, the military’s negotiator with opposition leader Aung San Suu Kyi. 2012 September – Moe Thee Zun, the leader of student protests in 1988, returns from exile after Burma removed 2,082 people from its blacklist. President Thein Sein tells the BBC he would accept opposition leader Aung San Suu Kyi as president if she is elected. 2012 November – Visiting European Commission chief Jose Manuel Barroso offers Burma more than $100m in development aid. Around 90 people are killed in a renewed bout of communal violence between Rakhine Buddhists and Rohingya Muslims. President Barack Obama visits to offer “the hand of friendship” in return for more reforms. He urges reconciliation with the Rohingya minority. The transformation in attitude by the government, recognized by the relaxing of restrictions by the US and other countries, then visits by the Secretary of State and the President, have made Myanmar (or Burma, of which more later) the hottest tourist destination on the planet. But Carol and I will not be doing the usual tourist thing, thanks to Dotty (again, more later). So, first, a bit about Myanmar. Here’s a map to get you situated. For a very quick summary of the country, I’ve pieced together (stolen) the material below from National Geographic, Wikipedia and the BBC websites. Please excuse the patchwork approach, but I was going for information, not art. The majority of Myanmar’s more than forty-eight million people are ethnic Burmans, who are distantly related to the Tibetans and the Chinese. Other ethnic groups (including Shans, Karens, and Kachins) add up to some 30 percent of the population. Ethnic minorities are dominant in border and mountainous areas: Shan in the north and northeast (Indian and Thai borders), Karen in the southeast (Thai border), and Kachin in the far north (Chinese border). The military regime has brutally suppressed ethnic groups wanting rights and autonomy, and many ethnic insurgencies operate against it. Burman dominance over Karen, Shan, Rakhine, Mon, Rohingya, Chin, Kachin and other minorities has been the source of considerable ethnic tension and has fuelled intermittent protests and separatist rebellions. Military offensives against insurgents have uprooted many thousands of civilians. Ceasefire deals signed in late 2011 and early 2012 with rebels of the Karen and Shan ethnic groups suggested a new determination to end the long-running conflicts. The country was colonized by Britain following three Anglo-Burmese Wars (1824–1885). British rule brought social, economic, cultural and administrative changes. With the fall of Mandalay, all of Burma came under British rule, being annexed on 1 January 1886. Throughout the colonial era, many Indians arrived as soldiers, civil servants, construction workers and traders and, along with the Anglo-Burmese community, dominated commercial and civil life in Burma. Rangoon (Yangon) became the capital of British Burma and an important port between Calcutta and Singapore. Burmese resentment was strong and was vented in violent riots that paralysed Yangon on occasion all the way until the 1930s. Some of the discontent was caused by a disrespect for Burmese culture and traditions such as the British refusal to remove shoes when they entered pagodas. Buddhist monks became the vanguards of the independence movement. U Wisara, an activist monk, died in prison after a 166-day hunger strike to protest a rule that forbade him from wearing his Buddhist robes while imprisoned. On 1 April 1937, Burma became a separately administered colony of Great Britain and Ba Maw the first Prime Minister and Premier of Burma. Ba Maw was an outspoken advocate for Burmese self-rule and he opposed the participation of Great Britain, and by extension Burma, in World War II. He resigned from the Legislative Assembly and was arrested for sedition. In 1940, before Japan formally entered the Second World War, Aung San (father of Aung San Suu Kyi) formed the Burma Independence Army in Japan. A major battleground, Burma was devastated during World War II. By March 1942, within months after they entered the war, Japanese troops had advanced on Rangoon and the British administration had collapsed. A Burmese Executive Administration headed by Ba Maw was established by the Japanese in August 1942. Wingate’s British Chindits were formed into long-range penetration groups trained to operate deep behind Japanese lines. A similar American unit, Merrill’s Marauders, followed the Chindits into the Burmese jungle in 1943. Beginning in late 1944, allied troops launched a series of offensives that led to the end of Japanese rule in July 1945. However, the battles were intense with much of Burma laid waste by the fighting. Overall, the Japanese lost some 150,000 men in Burma. Only 1,700 prisoners were taken. Although many Burmese fought initially for the Japanese, some Burmese, mostly from the ethnic minorities, also served in the British Burma Army. The Burma National Army and the Arakan National Army fought with the Japanese from 1942 to 1944, but switched allegiance to the Allied side in 1945. Following World War II, Aung San negotiated the Panglong Agreement with ethnic leaders that guaranteed the independence of Burma as a unified state. In 1947, Aung San became Deputy Chairman of the Executive Council of Burma, a transitional government. But in July 1947, political rivals assassinated Aung San and several cabinet members. Independence from Britain in 1948 was followed by isolationism and socialism. On 2 March 1962, the military led by General Ne Win took control of Burma through a coup d’état and the government has been under direct or indirect control by the military since then. Between 1962 and 1974, Burma was ruled by a revolutionary council headed by the general, and almost all aspects of society (business, media, production) were nationalized or brought under government control under the Burmese Way to Socialism which combined Soviet-style nationalization and central planning with the governmental implementation of superstitious beliefs. A new constitution of the Socialist Republic of the Union of Burma was adopted in 1974, until 1988, the country was ruled as a one-party system, with the General and other military officers resigning and ruling through the Burma Socialist Programme Party (BSPP). During this period, Burma became one of the world’s most impoverished countries. There were sporadic protests against military rule during the Ne Win years and these were almost always violently suppressed. On 7 July 1962, the government broke up demonstrations at Rangoon University, killing 15 students. In 1974, the military violently suppressed anti-government protests at the funeral of U Thant. Student protests in 1975, 1976 and 1977 were quickly suppressed by overwhelming force. In 1988, unrest over economic mismanagement and political oppression by the government led to widespread pro-democracy demonstrations throughout the country known as the 8888 Uprising. Security forces killed thousands of demonstrators, and General Saw Maung staged a coup d’état and formed the State Law and Order Restoration Council (SLORC). In 1989, SLORC declared martial law after widespread protests. The military government finalized plans for People’s Assembly elections on 31 May 1989. SLORC changed the country’s official English name from the “Socialist Republic of the Union of Burma” to the “Union of Myanmar” in 1989. In May 1990, the government held free elections for the first time in almost 30 years and the National League for Democracy (NLD), the party of Aung San Suu Kyi, won 392 out of a total 489 seats (i.e., 80% of the seats). However, the military junta refused to cede power and continued to rule the nation as SLORC until 1997, and then as the State Peace and Development Council (SPDC) until its dissolution in March 2011. On 23 June 1997, Burma was admitted into the Association of Southeast Asian Nations (ASEAN). On 27 March 2006, the military junta, which had moved the national capital from Yangon to a site near Pyinmana in November 2005, officially named the new capital Naypyidaw, meaning “city of the kings”. In August 2007, an increase in the price of diesel and petrol led to a series of anti-government protests that were dealt with harshly by the government. The protests then became a campaign of civil resistance (also called the Saffron Revolution), led by Buddhist monks, hundreds of whom defied the house arrest of democracy advocate Aung San Suu Kyi to pay their respects at the gate of her house. The government finally cracked down on them on 26 September 2007. The crackdown was harsh, with reports of barricades at the Shwedagon Pagoda and monks killed. However, there were also rumours of disagreement within the Burmese armed forces, but none was confirmed. The military crackdown against unarmed Saffron Revolution protesters was widely condemned as part of the International reaction to the 2007 Burmese anti-government protests and led to an increase in economic sanctions against the Burmese Government. In May 2008, Cyclone Nargis caused extensive damage in the densely populated, rice-farming delta of the Irrawaddy Division. It was the worst natural disaster in Burmese history with reports of an estimated 200,000 people dead or missing, and damage totaled to 10 billion dollars (USD), and as many as 1 million left homeless. In the critical days following this disaster, Burma’s isolationist government hindered recovery efforts by delaying the entry of United Nations planes delivering medicine, food, and other supplies. 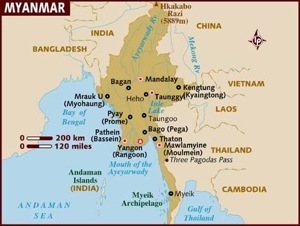 Myanmar is a resource-rich country with a strong agricultural base, and is a leading producer of gems, jade, and teak. However, military rule prevented the economy from developing, and the Burmese people remain poor. A largely rural, densely forested country, Burma is the world’s largest exporter of teak and a principal source of jade, pearls, rubies and sapphires. It has highly fertile soil and important offshore oil and gas deposits. Little of this wealth reaches the mass of the population. The economy is one of the least developed in the world, and is suffering the effects of decades of stagnation, mismanagement, and isolation. Key industries have long been controlled by the military, and corruption is rife. The military has also been accused of large-scale trafficking in heroin, of which Burma is a major exporter. The EU, United States and Canada imposed economic sanctions on Burma, and among major economies only China, India and South Korea have invested in the country. Burma’s wealth of Buddhist temples has boosted the increasingly important tourism industry, which is the most obvious area for any future foreign investment. When Carol and I originally planned this trip, we did it through a California travel agent. We had a very good and traditional tourist itinerary all set up, but then we met Dotty Guyot, through our friends, Sharon Silverman and David Zimberoff. Dotty was a college classmate of David’s, obtained a PhD in Southeast Asian studies from Yale (thesis: the Japanese occupation of Burma during World War II) and has lived in Myanmar for nine years. She and her husband Jim run an English language, precollegiate school for talented high school graduates in Yangon. Students complete a one-year course and then are placed in universities, primarily in the US and Japan. Carol and I have gotten to know one of their graduates, Arkar Hein, who is now a sophomore at Northwestern University. Dotty has enthusiastically offered to structure our trip and to introduce us to many people in different walks of life. We have jumped at her offer and abandoned our original plans in favor of Dotty’s recommendations, with the help of a local travel agent, Thiri, who Dotty put us in touch with. You will be reading a great deal about the plans that Dotty has made for us in this blog, as they constitute the backbone of our trip. So, this is your rather helter-skelter introduction to Myanmar and how our trip came about. We’ll try to fill in some of the gaping holes and add a little order to the chaos as we progress on our journey. Wishing you a safe and wonderful trip!